Home Publications Annual Reports Suicide attacks as the major tool of militants fighting against the state. Suicide attacks became major tool of the militants fighting against Pakistani State. 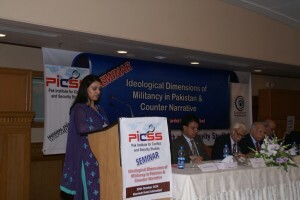 A study by an Islamabad-based independent think tank Pakistan Institute for Conflict and Security Studies (PICSS) shows that Suicide attacks caused 46% of the overall deaths caused by all militant attacks in 2018 while 48% of the total number of people injured in militant attacks was caused by the suicide attacks. During the year 2017, the percentage of deaths in suicide attacks was 33%. 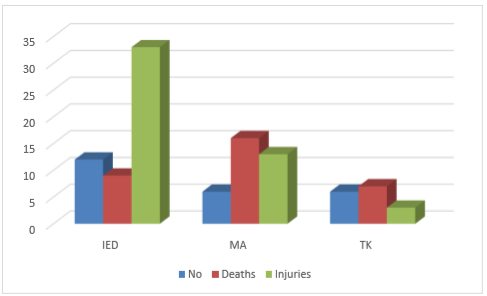 Another striking aspect revealed in PICSS Annual Security Journal is that the ratio of death in per suicide attack also increased from 13 to 15 in 2018 compared with 2017. 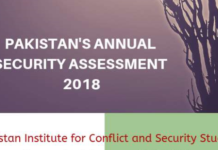 The year 2018 saw overall decline in suicide attacks compared with 2017 as the year witnessed 18 attacks compared with 23 in the previous year. The year 2018 saw 18 suicide attacks in total which were slightly less than those of 2017; having 23 suicide attack. 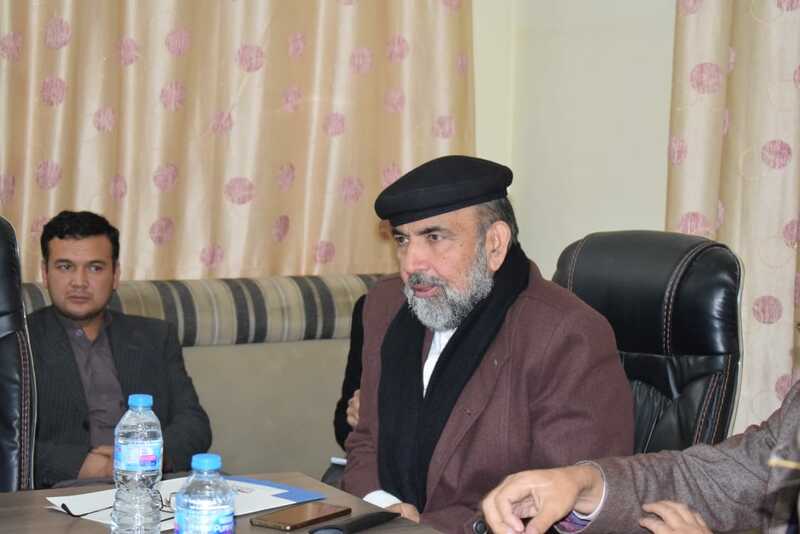 In 2018, 267 people were killed, including 205 civilians, 20 militants, and 42 security forces personnel, while 460 were injured, including 384 civilians, and 76 security forces.23 suicide attacks in 2017, caused 299 causalities, including 216 civilians, 25 militants, and 58 security forces personnel, which is quite a high ratio as compared to 2018.in 2017, 799 people were injured in suicide attacks including 57 security forces personnel and 742 civilians. An average of 15 people died in every attack held in 2018 whereas average 13 died due to suicide attacks in 2017. 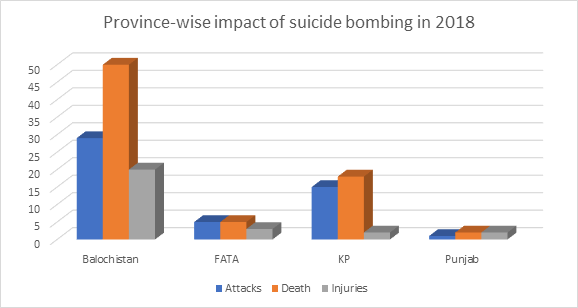 An average of 26 people were injured by suicide attacks in 2018, and 35 in 2017 respectively. 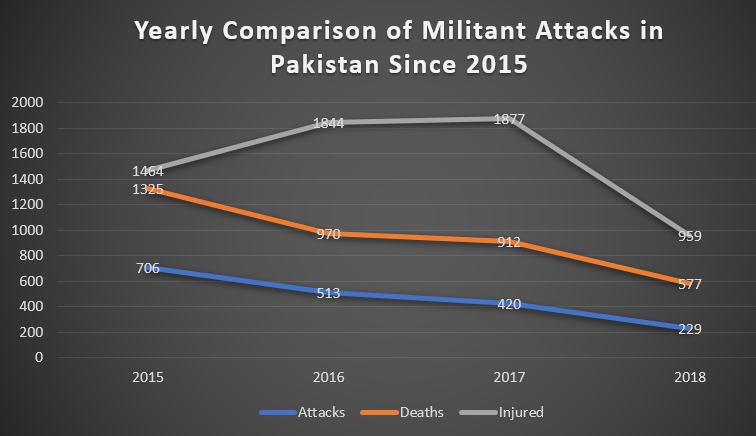 Suicide attacks caused 46% of the total deaths caused by all militant attacks in 2018, while in 2017 it was 33% of the total deaths caused by militant attacks. 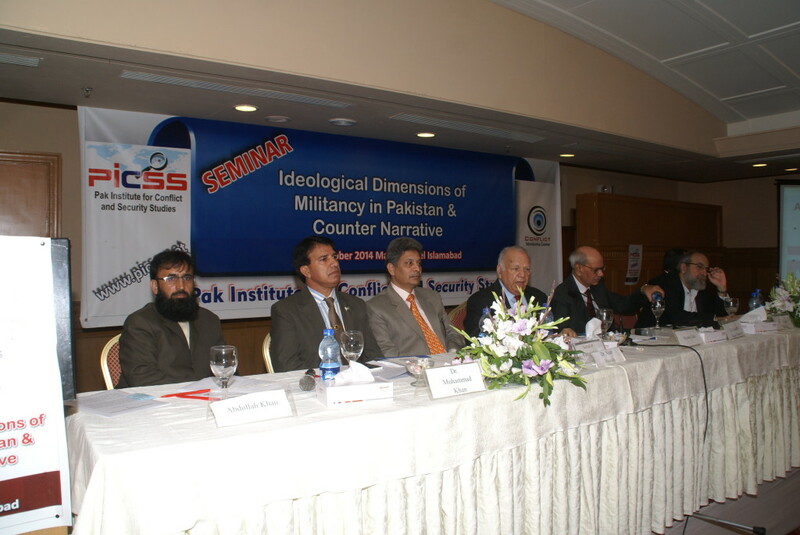 Most of the causalities occurred in a suicide attacks done in February 2017 in sehwan, Sindh, killing 77people; including 76 civilians, 1 militant and injured around 250 people. 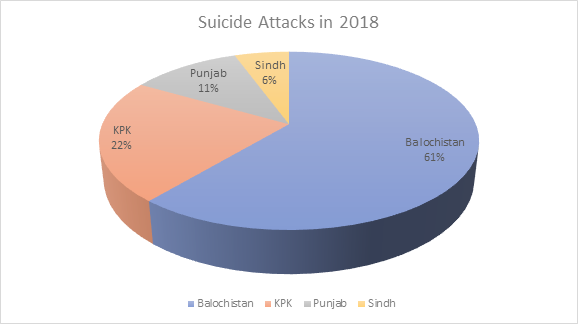 In 2018, a suicide attack in Balochistan killed 181 people, including 174 civilians, 6 security forces personnel, one militant, and injured 256 civilians. The province of Balochistan was hit by eleven suicide attacks last year, in which 212 people were killed, including 24 security forces personnel, 12 militants, and 176 civilians, while 332 were injured which includes 49 security forces personnel and 283 civilians. In Khyber-Pakhtunkhwa, 4 suicide attacks caused 38 deaths, in which 12 security forces personnel, 4 militants, and 22 civilians were dead and 91 were among injured, in which 70 civilians and 21 security forces personnel. 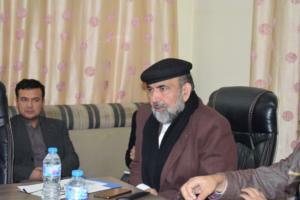 FATA had no suicide attacks this year. Province of Punjab had only one suicide attack, in which 14 people were dead due to Suicide attacks including 6 security forces personnel and 7 civilians, while two of the civilians got injuries. Sindh too had one suicide attack in which three militants died.